As usual, constant reader, you are tasked with deciding the outcome of this bout by way of comment. On the last edition of Friday Night Fights, the SpaceSHIP spectacular Iomedes blasts off to victory 12 to 5. Tune in next week for another action packed edition of Friday Night Fights! Lovebot for sure. Am I the only one who finds valentron really creepy? Valvatron, Maybe because it is mildly creepy, but then again, so is lovebot. Valentron! I like the transformer idea. 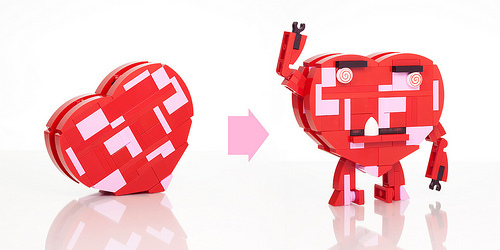 Always loving new shapes, concepts and innovations, my choice is going to “LOVEBOT”. 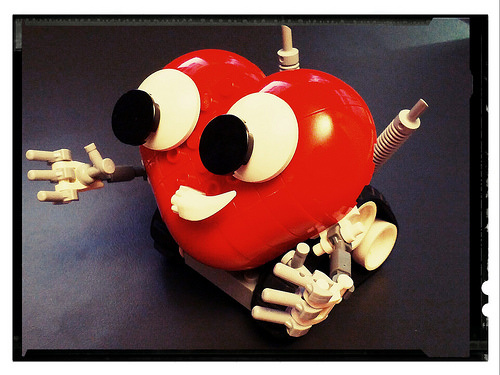 Lovebot. It’s curves are great. Oh wow this one’s tough. I think I gotta give it to Valentron because it’s got more personality. The use of those new domy arch pieces are really wonderful on Lovebot though. But personality wise it’s a little bland and uninspired(I think) And Valentron is more Valentine’s Day-y. I’m going for Lovebot. I must say, he’s almost cute.